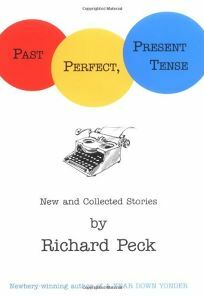 Two new stories pair with 11 previously published tales in Richard Peck's Past Perfect, Present Tense: New and Collected Stories, including ""Priscilla and the Wimps"" and ""The Special Powers of Blossom Culp."" However, it is Peck's introductions to each grouping of stories and his two additional sections for aspiring writers (""How to Write a Short Story""; ""Five Helpful Hints"") that make the collection exceptional: ""We write by the light of every story we ever read. Reading other people's stories shows you the way to your own.""